It is clear that Microsoft never tire of attacking rival Apple, and as usual it is often from Microsoft publishes videos you comparing their products with Apple products sarcastic manner, and it is what was done recently to promote her computer tablet Surface Pro 3. Microsoft, as usual, has published a video on YouTube at the expense of the satirical comparing between her computer tablet Surface Pro 3 and Apple Computer MacBook Air, and that in order to promote its product and convince users Bagtnaúh especially with the approach of the New Year's holiday. 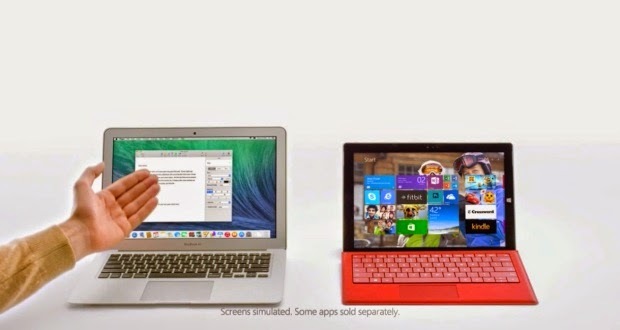 The satirical video which features her computer census Microsoft Tablet Surface Pro 3 especially electronic pen and tablet screen and keyboard, and others in an attempt to attract users to buy it.